I am cute and friendly and a total ball of energy! That`s all that matters, right?! Ha ha, my mom said she will write a full profile bio soon. Hi, it is Cammy, again! Mom said I can try this again and to tell my story this time :) I came to Mickaboo as a little baby so I don`t remember a whole lot and I guess that is a good thing because when I was about 4 weeks old I fell/dove headfirst into a scalding hot cup of tea straight from the microwave!!! I had 2nd and 3rd degree burns on my head, chest, left wing, left leg, both feet and well you get it. I still do not know how I made it, maybe because I am SO headstrong! I spent the first week in intensive care then my foster mommy came and got me. They say I have made an almost a full recovery! Amazing, right? I do still have a few minor glitches such as nerve pain in my leg and wing, my beak/nose has some minor issues and a few other small things but I am really well recovered and looking at me you would almost not know! Mom says I certainly don`t act like a burn victim as I am very energetic, love to play and run all over and get into everything!!! Lately I have been finding my `own` and defending it whatever `it` may be (everything!) but she is working with me on proper behavior and that everything is not mine! I am well socialized and am told I am a good girl all the time! 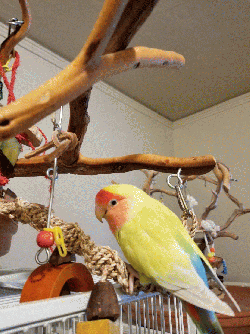 If you think I may be a good fit for you please contact the Mickaboo Lovebird coordinators and someone will get back to you as soon as they can! Remember to ask for Cammy (the Great!) **Note - Cammy is a very energetic little girl (now 6 months old) and coming into her own. While he has made a full recovery, burn victims often will show other medical issues down the road. Hopefully the latest nasal issue has resolved and there will be no more problems. Update 2/2017 - Cammy, while a very lively, chewalicious, rambunctious little girl, has been having reoccurring infections from the original tissue damage in his throat. This will most likely be a lifelong thing requiring more frequent vet visits than a `normal` bird along with needing antibiotics and is something to be aware of. (5/5/17-He has not had an infection since Feb 2017) Update- 9/2017- Ellen and Cammy are now bonded however need to be separated. Cammy does do well as a single lovebird. Update from Cammy`s current forster mom 1/3/18 - He is a very energetic young female. SHe does still have issues with cage aggression and can be very nippy/bite hard but also at times sit nicely on your shoulder/arm or even your head. Thinks he will do well as a single bird with a family who can spend time and has much patience (she is one of 6 birds in his current foster home so not a lot of one on one can be done with her at this time). she can become lonely and display boredom behavior like chewing on the cage bars to try to get attention. SHe is bonded with Ellen but also does ok without her. It will be unknown how she will get along with another lovie so introduction to another one should be done with close supervision and not forced. sHe can at times get nippy even with Ellen. UPDATE!!!! 1/2019 Cammy is a girl! She has laid 2 eggs, and while she can still be pernicious she has mellowed quite a bit. She also recently had a clean bill of health from the vets:) (and is not on medication!!! ).